I don’t think any parent would argue against chores being beneficial for their kids. Everyone knows that learning to work is about as basic as it gets. So why is it that so few kids have to do chores? There are several factors that fight against our desire to teach our kids the value of work. Let’s look at them and shoot them down, one by one. I don’t have time – It does take time on the front end, no doubt about it. You have to guide them through the process of bed making or floor sweeping. It is faster to do it yourself. Absolutely. It would also be faster to do their homework for them but we all see the downside of that plan. The same downside exists here. We tend to focus on things that show to the outside world like grades and sports and dance lessons. No one will see their successes at home, but the pay-off is much higher than any of their other extra-curricular activities. If you can help with those activities, you need to prioritize in such a way that helping with chores gets on the list. Just like Dad (or Mom) helping them learn to catch a fly ball, a parent should guide them in these basic life skills. They don’t have time – Kids are busy these days. If they are too busy for basic chores, something in their life needs to go. If they live in a family where no work is required of them, you are actually raising them in a fantasy world. You are busy and you still have to do your chores. Our ultimate goal is to raise them to adulthood. Without the basic knowledge of household skills, they are unable to function as a contributing adult. We all make the time. That is a skill in itself. They will never diagram a sentence again but they will need to clean a kitchen at some point in their lives. It’s your job to teach them. They do a bad job – Kids stink at chores at first. I’m not gonna lie. You have to put up with some crumbs on the floor and some wrinkles in the covers. You can do it! You are allowed to point out the problems without expecting perfection. They do get better at it, they really do. It takes more time than you want it to. Take some deep breaths, encourage them and then point out what you would like to see (and then you can go over it when they aren’t looking or finish it up by way of demonstration). Deep down, your kids want to please you. You will get to see this in action. I don’t know what to expect of them – This can be the biggest hindrance to getting started. You don’t want to frustrate them by giving them a job they are simply not ready for. Here’s a list of chores and the ages of the kids I know that actually do them. Yes-actual, normal kids. Picking up their toys – any age. Any child who is capable of getting out toys is capable of putting them away. Be careful not to micro-sort their toys beyond their ability to follow your system. Keep it very basic. Making their beds – 3 and up. My smaller kids only have a flat sheet and a comforter. This makes bed-making super easy. They should be the ones arranging their stuffed animals and keeping up with any additional blankies. Cleaning their rooms – This chore is the toughest. It takes a lot of critical thinking skills about sorting and ordering what to do first. That’s where you come in. You have to teach them how to clean their rooms. Grab a book or your laptop and settle in. Call out a category, like shoes, make sure there is a set place to put them, and see that your kid gets them there. Then pick another category and repeat. A younger child, like 6 or younger may need a basket for shoes to be thrown in at random. An older child can line them up in order. The same goes for toys and other categories. 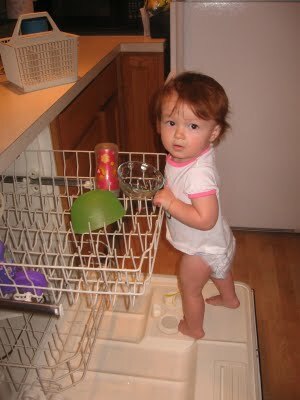 Emptying/Filling the dishwasher – My 5-year old niece fills the dishwasher. I have never started mine that early because I have older kids, but clearly it is possible. A 7-year old child can empty it for sure and they can fill it too. This job takes several lessons about what goes where and how to make sure the water is not blocked from doing its job. They need to know how to secure things to avoid that most awful of smells….burnt plastic in on the heating element. Clearing and cleaning the table – Little ones of about 5 love to do this one. If you don’t eat at your table, well…that’s another blog post for another time but basically, it is as important as chores. To make this easier, assign one person the job of clearing the space and wiping it down. Laundry – A 10-year old can be taught how to sort their clothes, pick a setting, add detergent and press start. An 8-year old can fold their own clothes, although not as well as you. When you are folding clothes, don’t let your child just sit and watch TV. Give them their own clothes to fold. In the yard – All children should have to pick up their own toys and put away their bikes. The littlest ones can help pick up sticks before an adult mows the lawn. There are other jobs not listed that your child can do. Sometimes it takes some trial and a lot of error. One thing I have learned is for the family to do chores at the same time. A mysterious spirit of work comes over the house and makes things start to hum. Your kids want to be with you and they want to be a grown-up like you. Also, don’t get hung up on allowance or rewards. Unless your child does something extra, like cleaning out the garage or raking the leaves, let them know that chores are just something we do to help each other live in a nice house. Your only reward is a clean place to live and play. It should be the same for them. They should do their assignment without parceling out the belongings to individuals. If you don’t make everyone wash their own dish, then you shouldn’t make everyone pick up their own shoes in the livingroom. Emphasize the sharing and the community thinking behind the work. We can function as one in a family. That may be the biggest lesson of all. This entry was posted in parenting styles and tagged allowance, housework, kids do chores, kids helping at home, rewards for chores, what age should kids get chores by lookmom. Bookmark the permalink.